Our history is one deeply rooted in France, with remarkably strong women, and in the belief that education transforms society. 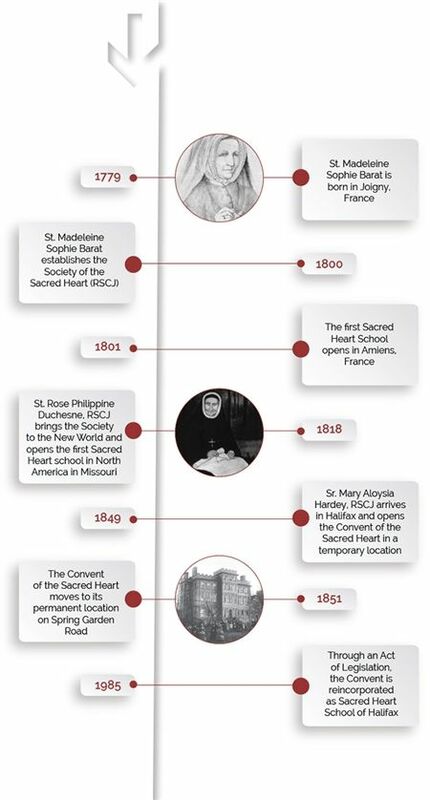 In 1800, in post-revolutionary France, a passionate and brilliant young woman named St. Madeleine Sophie Barat started the Society of the Sacred Heart of Jesus (RSCJ) based upon her belief that education, particularly of girls, could transform society. Her thinking, particularly in that time of upheaval, was downright innovative, and her philosophy of educating the whole child — spiritual, intellectual, moral, and social — continues to be the foundation for all Sacred Heart schools around the world. In 1818, Sophie’s friend and disciple, St. Rose Philippine Duchesne, was granted permission to expand the Society to the new world. In true pioneering spirit, she made the perilous journey across the Atlantic in the ship The Rebecca. Almost immediately upon her arrival she established the first school in North America in St. Louis. Expansion followed quickly throughout the United States, Cuba, and into Canada. In 1849, Sister Hardey led a group of RSCJ to Halifax and took up residence at Brookside, now the Lord Nelson Hotel. Seven days after arriving, they opened a school and began teaching the city’s young girls. In 1851, the RSCJ moved into our present building, and operated it as the Convent of the Sacred Heart until 1985 when it was reincorporated and named Sacred Heart School of Halifax. In the mid 1900’s, the RSCJ also operated the College Street School, a publicly-funded co-ed Sacred Heart School, from the same campus. In 2005 a boys’ high school division was created and housed in temporary quarters at the Canadian Martyrs Church on the SMU Campus where it remained until 2010, when the Fountain Academy of the Sacred Heart was built on our current campus. Today, there are over 150 schools in 33 countries across six continents as part of the Sacred Heart network. Our schools are part of an expansive family to which each child of the Sacred Heart forever belongs. Together, we educate promising young women and men to lead lives filled with meaning, purpose and prosperity of spirit, guided by our shared values.